That dodgy looking substance you’ve been dutifully removing from your ears all these years is actually called cerumen (ear wax)—and it’s responsible for keeping your ears clean. Seriously. 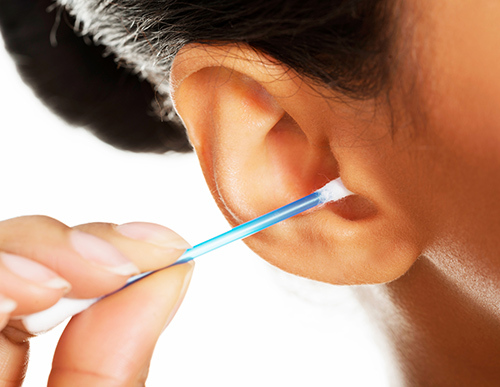 Cerumen catches dust and debris before it travels deeper into your ear canal where it could possibly get trapped. The ordinary daily mechanics of just talking, chewing and yawning actually moves ear wax down and out of the ear canal so you don’t have to do anything else, really. Using a swab, fork, key, finger, chopstick, pencil or any other foreign implement for ear wax removal actually reverses your ears’ self-cleaning process, pushing used ear wax deeper into the canal where it can get impacted and lead to injury and hearing loss. While we all shudder at the thought of an ear wax flavored Bertie Bott’s Every Flavor Beans jellybean, the fact is, cerumen has all kinds of health properties that help keep your ears healthy. Ear wax has several health benefits aside from moving the dirt out of your ears. It protects your ears against viruses, fungal infections, bacteria, and even insects! It also moisturizes and conditions the skin inside of the ear canal, keeping it healthy and supple. Cerumen is a fascinating recipe of long-chain fatty acids, cholesterol, alcohols, sebum, sloughed off skin cells, enzymes and other chemicals that are produced by special glands inside your ears. Your ears concoct this special recipe to keep your ears clean and infection free. In fact, average cerumen is slightly acidic—which inhibits fungal and bacterial growth. Yay ear wax! Nearly 12,500 American children sustain ear cleaning injuries each year for which they need a doctor’s visit. Sometimes the well-meaning parents do it under the false impression that ear cleaning is as necessary as teeth brushing. But often the kids do it themselves. The most common of these injuries include tympanic membrane tears (torn ear drum) or other small cuts and lacerations inside the ear canal. All you really need to do is gently dab your ears dry with a towel after your daily shower and hair washing routine. Normally, this is entirely sufficient for healthy ear cleaning. But if you have any concerns about your ear health, excess ear wax, impaction, ear injury or hearing loss, schedule an appointment with your hearing care professional today for appropriate care – and be a little more thankful for that hard-working cerumen!